Survey: OPEC Pumps 29.9 Million Barrels of Crude Oil Per Day in Oct.
LONDON, Nov. 13, 2013 /PRNewswire/ – Crude oil production from the Organization of the Petroleum Exporting Countries (OPEC) remained broadly unchanged at 29.93 million barrels per day (b/d) in October following production of 29.91 million b/d in September, a just-released Platts survey of OPEC and oil industry officials and analysts showed Tuesday. Increased output from Iraq and Libya of 360,000 b/d was almost completely offset by reductions totaling 340,000 b/d, of which the biggest single cut was from Saudi Arabia. Libya began October with production around 650,000 b/d to 700,000 b/d, on the heels of an agreement with striking workers in late September that allowed output to resume at the Elephant and Sharara fields in the west of the country. But subsequent rounds of disruptions, including a protest at the port of Mellitah and another stoppage at Sharara, again pushed back output, with volumes for the month averaging 540,000 b/d. Iraqi output recovered to around 3 million b/d in October from 2.8 million b/d in September, when work to install a metering and manifold system in Basrah had resulted in a plunge of 350,000 b/d from estimated August output of 3.15 million b/d. Continuing maintenance work at the key southern terminal will keepIraq’s crude exports at levels lower than capacity for the remainder of this year and into 2014, sources said earlier this month. The impact on exports through yearend will be about 250,000 b/d, the sources said. Saudi Arabia, whose direct burn of crude in power stations climbs during the summer months when air-conditioning demand soars, reduced output by 250,000 b/d to 9.75 million b/d. The October total leaves OPEC output below 30 million b/d for the second consecutive month and brings it closer to the oil producer club’s forecast of demand for its crude – 29.9 million b/d this year and 29.6 million b/d in 2014. 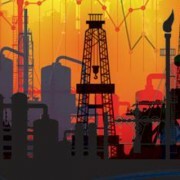 In its latest monthly oil market report, released earlier Tuesday, OPEC said it expected the call on its crude to drop from 30.41 million b/d in the fourth quarter of this year — a downward revision of 310,000 b/d from the previous forecast — to 29.16 million b/d in the first three months of 2014. OPEC will review oil output policy at ministerial talks on December 4 in Vienna. There have been no indications to date that the group plans to make any adjustments to its current informal output management system, which relies largely on Saudi Arabia to make adjustments by tweaking its own volumes up and down. The group’s 30-million-b/d ceiling has been in place since January 2012 but does not include production quotas for individual countries.